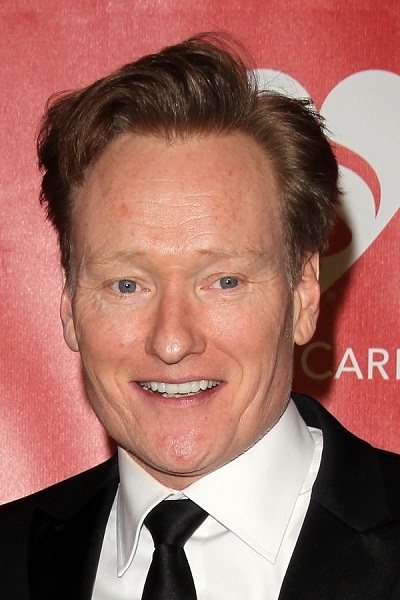 Place of Birth: Brookline, Massachusetts, U.S.
Conan O’Brien is an American television host, comedian, writer, producer, and musician. He has hosted the show Conan since 2010. He previously hosted the shows Late Night with Conan O’Brien, from 1993 to 2009, and The Tonight Show with Conan O’Brien, from 2009 to 2010. I had genetic testing done… Lisa Kudrow got me to do it ’cause she has that show [Who Do You Think You Are? ]… [and I am] 99.8 percent Irish… I think I’m more Irish than people living in Ireland. Conan is married to Elizabeth Ann Powel, with whom he has two children. Through marriage, he is a distant cousin of comedian and actor Denis Leary. Conan’s paternal grandfather was named Thomas Francis O’Brien. Thomas was born in Massachusetts, to Irish parents, with his father being from Dungarvan, Waterford, Munster. Conan’s paternal grandmother was named Esther M. Esther was born in Massachusetts, to an Irish father and a Massachusetts-born mother. Conan’s maternal grandfather was James Francis Reardon (the son of Patrick J. Reardon and Margaret Joyce Marshall). James was born in Massachusetts. Patrick was born in Kilcummin, Kerry, Ireland, the son of John Reardon and Margaret Daley. Conan’s great-grandmother Margaret Marshall was born in Castleisland, Kerry, Ireland, the daughter of John Marshall and Mary Connor. Conan’s maternal grandmother was Ruth Frances Powers (the daughter of Edward B. Powers and Mary E. Gavin). Ruth was born in Massachusetts. Edward was born in New York. Mary E. was born in Massachusetts, the daughter of Irish parents, James Gavin and Bridget. He had said his wife was 50% Irish, 25% Scottish, and 25% Welsh. Where about in Ireland do the ancestors of unmixed Irish Americans come from I’m guessing Southern Ireland not so much fun Northern Ireland. He is from Boston there is a lot of unmixed Irish Americans in Boston due too large number of Irish families. He is ancestry is pure Irish he has no English Scottish and Welsh he has 100% Irish.